The best boss I ever had was Ron Urcil, a grocery store manager of West End IGA in Brandon, Manitoba. He was my boss through my high school years and undergrad university. I can still see Ron smoking like a chimney, swearing like a sailor, and telling the most hilarious jokes. Rumor was he had been a stand up comedian before getting into the grocery business. Ron taught me a lot about customers, merchandising and hard work. Although he oversaw a pretty big staff, Ron would always take time to ask his front-line employees how they were doing. I was one of them. I was the guy stocking shelves, pushing carts, bagging groceries for the cashiers (usually selecting the ones that I had crushes on!) and answering price-checks. He knew that we were his front line employees when dealing with customers and we better keep the customers happy. Every week, a couple would come in to West End IGA and buy a bunch of perfect bananas. Then, later in the week, they would return a few bad banana, requesting money back for the entire bunch- or a full replenishment of a bunch. But, they wouldn't just do this for produce. They would also run the scam with meats. I'd seen it a few times and Ron noticed it too. One day, the couple was at it again, so Ron tapped me on the shoulder and said, "Come with me Bob, watch and learn how we are going to handle this." We approached the couple and Ron, with a broad smile said, "Great to see you today! How are you?" After the couple responded, Ron continued, "I know that you're regular shoppers here. We love having you shop here. We've also noticed that you've been having trouble with some produce and some meat. Here's what we'll do. Bob and I will help you shop today. Think of us as your personal shopper for produce and meat. We want you happy with what you pick so none of us will have the hassle of a return. Of course, if the ones we pick out end up end up being returned, well... then that's not being honest." The couple agreed and never returned to the store. Ron had fired undesirable customers. He was so eloquent. He sent them away. Ron's reason for firing the couple, of course, was driven by dollars and cents. There is another reason why companies ought to legitimately fire customers- and it is does not receive nearly the profile that it ought to. Some customers simple request for unethical / immoral purchases. In my consulting, I advise companies to fire both non-profitable customers (unless their is strategic reason to keep them) and to have a code of ethics in business. This way, if a customer violates the standards, the decision to fire the customer is a lot easier. I've heard the argument so many times that business will do whatever- and sell whatever- so long as it is legal. This has not been my experience. Companies and brands have values. They stand for things. If the brand does a transgression, consumers will demand accountability. Management also has things that are important to them. Here's an example to make my point. 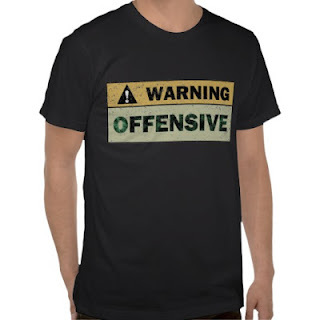 Companies like CafePress, TShirt Hell, and Zazzle, which position themselves "offensive design companies" have limits (The limits might still be minimal, but they are there). Consider Zazzle's response to an intentionally offending purchase order. "We are sorry to inform you that we are unable to process your Zazzle order due to violations in your Zazzle design. You can expect the returning funds to be available in your account within the next 7-10 business days, depending on the processing speed of the financial institution that authorized the initial transaction. You can easily modify your product and reorder to fit within the allowed guidelines. Instructions for this process are outlined below. If you choose to modify and reorder, we will give your new order special attention to make sure your customized products arrive quickly." Zazzle will shoot down designs that contain content that can reasonably be viewed as discriminatory based on everything from race to disability-or wildly explicit and suggestive material. In short, they are saying, change what you write or get lost. And they do it in such a nice way, that my favorite boss Ron would be proud. Pope Benedict is retiring. So the religious, politicos, and newsy folks await for the Vatican smoke to announce the new Catholic CEO. I thought it would be timely to share a couple water-cooler thoughts on how Vatican CEOship compares to a corporate CEOship. As Pope, Benedict was "CEO" of over 500,000 employees (410,000 priests, 5,000 bishops, 40,000 deacons, 180 cardinals, and 55,000 nuns) and held official operations in 195 countries around the world. (I could only find two countries that either reject the authority of the Vatican (China) or ban the religion (Saudi Arabia) outright. Size of the Catholic market: 1.2 Billion. Of course, a good chunk of these Catholics are not loyal customers. But, some anecdotal evidence suggests there is more loyalty than you might first think. For example, in the USA where practicing rates are among the lowest in the world, 9/10 Catholics still make their first communion, the principle act of the religion's worship. Moreover, globally, more than 25,000,000 new Catholics make their first communion every year, and many repeat the Catholic sacrament every week. Now let's hit a direct comparison with a global organization that has powerhouse brands. Since Benedict was a German, let's draw his comparison to the Martin Winterkorn, the Chief Executive Officer (and Chairman) of Volkswagen. Volkswagen here refers the Volkswagen Group which includes subsidiaries Audi, Bentley, Bugatti, Lamborghini, Porsche, SEAT, Skoda, Volkswagen, MAN, Scania, Ducati and VW Commercial vehicles. Average number of employees at the VW conglomerate last year: 454,000. Total number of new cars sold in 2011 from the VW group: 8.2 million in 153 countries. From an employee, geographical reach, and customer base perspective, this job is a demotion from Papal CEOship. But don't fear for Winterkorn. 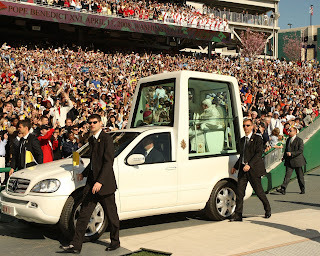 He's not eligible for the demotion (at 64 he is too young to be Pope! ), and his compensation last year based on pretty good performance was €12,926,206. Soon we'll hear about the smoke announcing the new pope. And when you see him for the first time, think of the what he might be doing if he taken the corporate route. Then think this, would CEOs like Winterkorn ever want to take on the Vatican CEO job that forbids luxury and a super hot trophy wife?